The principle objective of this report is to analysis Financial Activities of Al-Arafah Islami Bank Limited. Other objectives of this reports are to gather comprehensive knowledge on overall banking functions of the Al-Arafah Islami Bank Ltd, know about the policy of general Banking, Accounts and advance and loan recovery techniques. Here also explain the meaning and concept of consumer deposit Scheme. Finally interviewing the concern people to get information about the organizations present and future plan regarding this topic and to acquire in depth knowledge about AIBL. The main purpose of the study to know the overall lfinancial operational performance of the Al-Arafah Islami Bank Ltd .and fulfilling the practical requirements of the BBA program. The objective of Islamic banking is not only to earn profit but also to do good and welfare to the people. Islam upholds the concept that money, income and property belong to Allah and this wealth is to be used for the god of the society. To gather comprehensive knowledge on overall banking functions of the Al-Arafah Islami Bank Ltd.
To know about the policy of general Banking , Accounts and advance and loan recovery techniques. To explain the meaning and concept of consumer deposit Scheme. Interviewing the concern people to get information about the organizations present and future plan regarding this topic. To acquire in depth knowledge about AIBL . To know about the banking software. To conduct interest – free banking. To analyze the financial activities of Al-Arafah Islami Bank Ltd.
Islam provides us a complete lifestyle. Main objective of Islamic lifestyle is to be successful both in our mortal and immortal life. Therefore in every aspect of our life we should follow the doctrine of Al-Quran and lifestyle of Hazrat Muhammad (sm) for our supreme success. Al-Arafah Islami Bank started its journey in 1995 with the said principles in mind and to introduce a modern banking system based on Al-Quran and Sunnah. A group of established, dedicated and pious personalities of Bangladesh are the architects and directors of the Bank. Among them a noted Islamic scholar, economist, writer and ex-bureau craft of Bangladesh government Mr. A.Z.M. Shamsul Alam is the founder Chairman of the bank. His progressive leadership and continuous inspiration provided a boost for the bank in getting a foothold in the financial market of Bangladesh. 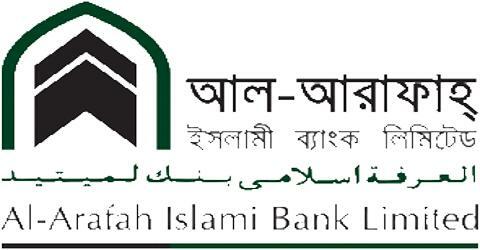 A group of 26 dedicated and noted Islamic personalities of Bangladesh are the member of executive council of the bank. They are also noted for their business acumen. Al-Arafah Islami Bank Ltd. Has 56 branches. Wisdom of the directors, Islamic bankers and the wish of Almighty Allah make Al- Arafah Islami Bank Ltd. most modern and a leading bank in Bangladesh. To conduct interest free banking. Its investment policies under different modes are fully Shariah complain. During the year 2009, 70% of the investment income has been distributed among the Mudaraba depositors. It believes in providing dedicated services to the clients imbued with Islamic spirit of brotherhood, peace and fraternity. The bank is committed towards establishing a welfare-oriented banking system to meet the needs of low income and underprivileged class of people. The Bank upholds the Islamic values of establishment of a just economic system through social emancipation and equitable distribution of wealth. Financial Performance of Al-Arafah Islami Bank Ltd.
AIBL is one of the new entrants of the 3rd generation banks having only 50 branches currently. With in short time period, AIBL has been to create an image as a progressive and dynamic financial institution for itself and has earned significant reputation in the country’s banking sector. Despite of stiff competition in banking sector, AIBL witness a considerable improvement in its overall business performance during 31 December, which contributed to consolidate the position of the bank. At the end of current year, the number of depositors stood at 243273 and the amount deposit has accumulated to Tk.16775.33 million. The total numbers investors are 13213 and total investment extended to them was a sum of taka 17423.19 million. The bank has earned Tk.2172.48 million and incurred an expense of Tk.1202.71 million in the current year. At the end of the year the profit before tax has stood Tk.855.47 million, which is 78.97% more than Tk.478.00 million pre-tax income of the last year. The total deposit of the bank was Tk.16,690.12 million at 31st December 2007, of which bank deposit was 611.72 million taka and general deposit was 16163.61 million taka. at the same time in the last year, the amount of total deposit was 29,690.12 million taka. In this area the growth rate 54.07%. Al-Arafah Islami Bank Ltd (AIBL) Play a vital role in giving a direction to economy’s development over time by financing the requirements of trade and industry. By encouraging thrift among people, banks, foster the process of capital formation. Banks induce the savers to hold their savings in the form socially useful assets of which bank deposits constitute the most important element. Through this the banks draw community savings into the organized sector which can then be allocated to different economic activities according to the priorities laid down by planning authorities of the country. The growth of economy is tied with the growth of banks in it. Banks operate as institutions for promoting industrialization, expansion of trade and commerce, development of agriculture, sustaining stability in price levels, settlement of payments for imports and exports and so on. Bai –Murabaha may be define as a contract between a buyer and a seller under which the seller sells certain specific goods (permissible under Islamic Shariah and the law of the land) to buyer at a cost plus agreed profit payable in cash or on any fixed future date in lump sum or by installments. The profit marked –up may be fixed in lump sum or in percentage of the cost price of the goods. Bai- Muajjal may be defined as a contract between a buyer and a seller under which the seller sells certain specific goods (permissible under Islamic Shariah and the law of the land) to buyer at a cost plus agreed profit payable on a certain fixed future date in lump sum or within a fixed period by installments. The seller may also sell goods purchased by him as per order and specification of the buyer. The hire purchase method of financing enables a bank to finance the purchase of movable and immovable assets. It is a joint ownership agreement subject to the provision of security/surety provided by the client. In addition to the repayment of the principal amount, the bank receives a share in the net rental value after allowing for necessary deduction on account of depreciation of asset. This payment is made after adjusting the bank’s outstanding share of the asset, which reduces with each installment payment made by the client. The cost of insurance of the asset is shared by the bank and the other party in proportion of their capital contribution to the asset. After the full payment has been made, the client becomes the owner of the asset. Until full payment has been made the client is only entitled to the use of the asset. Since this mode of Financing involves inflow of cash over a considerable period of time, the discounting techniques can be applied to evaluate the acceptability of the project. Each and every expected installment payment should be converted to present value by applying the appropriate discount rate. The next step would be to sum up the present value of the streams of cash inflows and compare it with the purchase price. A proposal yielding a positive net present value would be accepted and otherwise rejected. The same concept applies while applying the IRR method, whereby the minimum expected rate of return is calculated which would equate the present value of cash inflows with the initial cash outflow. An investment proposal failing to yield this minimum required rate of return should be rejected. It is a form of partnership in profit where by one party provides funds while the other provides expertise and management. The first part is called the Sahid-al-Maal and the later is referred to as the Mudarib. Any profit accrued is shared between two parties on a pre-agreed rates, while capital loss is exclusively borne by the partner providing the capital except it is due to the breach of trust by the Mudarib. Musharaka is a contract of partnership between two or more individuals or bodies in which all partners contribute capital, participate in the management, share the profit as per pre-agreed ratio and beat the loss, if any in proportion to their capital/equity ratio. Bai-Salam may be defined as a contract between a buyer and a seller under which the seller sells in advance the certain commodities/products permissible under Islamic Shariah and the law of land to the buyer at an agreed price payable on execution of the said contract and the commodities/products is/are delivered as per as specification, size, quality, quantity at a future time in a particular place. In other words, Bai-salam is a sale where by the seller undertakes to supply some specific commodities/products to the buyer at a future time in exchange of advance price fully paid on the spot. The risk of Al-Arafah Islami Bank limited is defined as the possibility of losses, financial or otherwise. The risk management of the Bank covers 6 (six) Core risk Areas of banking I . e Credit risk management, foreign exchange risk management, Assets Liability Management, prevention of money laundering and establishment of Internal Control and Compliance and information & Communication technolology. The prime objective of the risk management is that the Bank takes well calculative business risk while safeguarding the Bank‘s capital, its financial resources and profitability from various risks. In this context, the Bank took steps to implement the guidelines of Bangladesh Bank as under. Credit risk is one of the major risks faced by the Bank. This can be described as potential loss arising from the failure of a century party to perform as per contractual agreement with the Bank. The failure may result from unwillingness of the counter party of decline in his/her financial condition. Therefore, Bank’s credit risk management activities have been designed to address all these issues. The bank has an Investment (Credit) Risk management Committee at Head Office. The Committee reviews the Investment risk issues on monthly basis. The bank has segregated the Investment Approval, Investment Administration, Investment Recovery and Legal Authority. The Bank has segregated duties of the officers/executives involved in credit related activities. A separate Business Development (Marketing) Department has been established at Head Office, which is entrusted with the duties of maintaining effective relationship whit the customer, marketing of credit products, exploring new business opportunities etc. In the branches of the bank separate officials are engaged as Relationship Manager, Documentation Officer, Verification Officer, disbursement Officer and Recovery Officer. Their jobs have been allocated and responsibilities have been defined. The bank has implemented the Investment (Credit) Risk Grading Manual (IRGM) since April, 2006 which is made mandatory by Bangladesh Bank vide BRPD Circular No. 18 of December 11,2005. Investment Officials of the bank have been trained on IRGM. Investment Risk Grading is incorporated in the Investment presentation From for all the cases. Foreign exchange risk is defined as the potential change in earnings arising due to change in market prices. As per Foreign Exchange risk Management Guideline, bank has physically establishment a separate Treasury Department at Head Office. Under the Treasury Department, Foreign exchange Font Office, Foreign exchange Back Office and Local Money Market have been physically demarcated. Duties and responsibilities of them have also been defined. All foreign exchange transactions are revalued at Market-to Market rate as determined by Bangladesh Bank at the month-end. All Nostro accounts are reconciled on monthly basis and outstanding entry beyond 30 days is reviewed. General Banking Operation of Al-Arafah Islami Bank Ltd.
General banking is the most important and fundamental activities of a bank. The general banking performance of AIBL is very systematic and satisfactory. Various general banking activities are pointed below: The major activities of AIBL that it performs under general banking are explained in this section. The AIBL (Al-Arafah Islami Bank ) offers their customers general banking facilities, which ensures the safety of their money as well as the fair and smart return of their money. Two recent passport size photographs of the A/C holders duly attested by the introducer. Copy of passport if available or certificate from the chairman / commissioner or letter of introduction by a person accepted to the bank. Obtain and fill up the KYC (know your customer)from imposed by the Bangladesh bank. Admittance of the signature of the opener/ operators of the A/C. Preservation of Account Opening File (AFO) and specimen card. All terms for individuals A/C holder as stated above. Two or more persons can open A/C. Authorized persons can operate the A/C. Authority is automatically revoked by death, insanity or bankruptcy. Stoppage of payment by anyone of A/C holder. Partnership account is like a joint account. Must submit a copy of partnership Deed. The partners need to fill up the letter of Al-Arafah Islami Bank with their names and signatures. They have to submit a trade license. They have to fill up the KYC form. After fulfill all the requirements for opening account, necessary entries are given in the account opening register. There are several registers for several deposits as MSD, AWCD and TDR etc. Date of opening, name of the account holder, nature of the business address, initial deposit and introduction & various information are recorded that register. New number is given from the list of new accounts provided by the computer department. Cheque book is issued to the new customer after opening account as well as to existing customer after completing the use of previous cheque book. Two separate cheque books are given to current and savings deposits. AWCD accounts cheque book is consists of 20 and 50 leafs, while MSD account cheque book has 10 leafs. There is a cheque issue registers in this regard; where cheque book number, leaf number, dates of issue etc. information is kept. All the necessary numbers are sends to the computer department to give entry in the program. Issuance of the cheque to new customer is fee from any complexity. But incase of 2nd provision, of a complex process should be maintained. Each cheque book white leaf for issuing the next cheque book. Blank space for placing new range of cheque number and officers signature. Date issuing previous cheque book. Round shaped seal of Mirpur Branch with signature of authorized officer. Name of A/C holder written by officer. Clients should have to fill up the information headed by the item 1,2,4. By filling up this item properly, he/she will submit it to computer verification counter to verify the signature. Now what type A/C this is. Separate register book is to maintained for CD, MSD & SND-10leaf, CA-(20-50)leaf, and SND-has number specified limit. One of the most significant sources of deposits is the AL WADIA current deposit. It has some similarity with the current account of conventional bank. The term Al – Wadiah Current Deposit means deposit of money allowing somebody to sue it. Banks being a trustee preserves and keeps or in safe custody of what is deposited. Depositors feel safe in keeping their money with the bank and take transaction facilities. In case of Individual person for opening this account need two copies attested photo and an introducer who has an AL-WADIA CURRENT DEPOSIT. In case of sole proprietorship firm for opening this account need two copies attested photo and trade licence. In case of partnership firm for opening this account need two copies attested photo of those persons who can operate A/C and trade license and partnership deed. I n case of public limited company for opening this account need above documents and certificate of commencement. Mudaraba Saving Deposit (MSD) is open by the lower and middle classer people who wish to save a part of their incomes to meet their future need intend to earn an income from their savings. It aims at encouraging savings of non-trading person(s), institution(s), society, etc. by depositing small amount of money in the bank. In case of individual person for opening this account need two copies attested photo and an introducer who has a MUDARABA SAVINGS DEPOSIT. In case of non-trading person(s), institution(s), society, etc for opening this account need two copies attested photo of those persons who will operates A/c and an introducer who has a MUDARABA SAVINGS DEPOSIT. The number of withdrawals over a period of time is limited. Two withdrawals per week are permitted. But more than that no interest will be paid on rest amount for that month. The total amount of one or more withdrawal on any date should not exceed 25% of the balance in the account unless 7 (seven) days advance notice is given. Cash section demonstrates liquidity strength of a bank. it also sensitive as it deals with liquid money . maximum concentration is given while working on this section. As far as safety is concerned special precaution is also taken. All cash instruments (P.O,D.D and cheque) other valuables are kept in the vault is insured up to TK 4 cr with local insurance company. If cash stock goes beyond its limit of tk 4 cr the excess money is transferred to Bangladesh bank if there is shortage of cash during transaction period. Money is transferred to drawn from the central bank. there are three keys of the vault, which are given to three seniors most officers. Daily as estimated amount of cash brought out from the vault for transaction purpose. No more than 4 cr brought at once from the vault, on a single day. In short, a teller should be efficient. Cash packing & handling needs a lot of care as any mistake may creates a disastrous, impact during the banking hour. When the counter is closed, cash are packed according to denomination. Notes are counted several times and packed in bundle, stetted and stumped with initial. It deals with payment and cancellation of PO,DD,TT and Outward & Inward bills (OBC & IBC) etc. AIBL sells and purchase PO,DD, and TT to its customers only. A telegraph transfer (TT) is an instruction for transfer of money by telegraph cable and telex from a bank in one center to another bank in a different center. Generally this is an instruction from the importers bank to the exporters’ bank or some other bank in the exporters’ country for transfer of money to a named person. Here the remitter bears the additional charge of telex/ telephone. Charge for TT is 0.15% of the principal amount and the additional charge for telex. Telephone is TK. 50.00. Demand Draft is many popular instruments for remitting money from one corners of country another. The instrument is basically used for transfer and payment. Difference between pay order and demand draft is in terms of place only PO is used for remittance money with in the city where as DD is used for within the country DD too, constitutes current liability on the part of a bank. At AIBL DD is not sold to people other than its customer. Pay Order an instrument, which is used to remit money with in a city thorough banking channel the instruments are generally safe as most of them are crossed. Clearing stands for mutual settlement of claims made in among member banks at an agreed time and place in respect of instruments drawn on each other. Clearing house is an arrangement under which member banks agree to meet, through their representative, at the appointed time and place to deliver instruments drawn on them. The net amount payable or receivable as the case may be, is settled through an account kept with the controlling bank (Bangladesh Bank). The special feature of the investment policy of the Bank is to invest on the basis of profit – loss sharing system in accordance with the tenents and principles of Islamic Shariah. Earning is not only motive and objective of the Bak’s Investment policy rather emphasis is givien in attaining social goal and objective in creating employment opportunities. At the end of the year 2006, the amount of investment of the bank was Tk.17423.19 million in comparison to Tk.11474.41 million of the last year 2005.The amount of investment has increased 5948.78 million taka within this period, which is around 5184%. An investment product “Grameen & small investment” is in operation. The objective of this project is to introduce Shariah based banking system in rural and village area, creating employment through financing to low income group, build up savings attitude, improvement of living standard of rural low income mass people, creating opportunity to carry out Islamic lifestyle by way of alleviating poverty and at the same time to make other financially established by investing in small investment projects. Initially this scheme was introduced in three branches of AIDL i.e. Gallai, Comilla Ruposhpur Srimongal and Companion Comilla.There is a plan to expand this project gradually in other rural branches. SWOT analysis provides an opinion and adjustment whether organizations currently position is satisfactory or not. All the level of the management is solely directed to maintain a culture for the betterment of the quality of the service. The bank has earned customer loyalty as organizational loyalty. Skilled personals have developed professional relationships with their customers and clients, which is an emotional tie on regular business. AIBL is always trying to add new and modern equipments. Employees are sharing good atmosphere in AIBL so that it gave them reason to work efficiently and to become dedicated in banking. AIBL maintain corresponding relationship with many foreign banks so that it is an effective measure for the smooth business. The top management officials all have had reputed of banking experience, skill and proficiency. The advertising and promotional activities of this bank are up to the mark. Reference appointment is very much effective in AIBL. As a result of this there are many who are only drawing salaries at the end of the month but making a minimum contribution towards the organization. There are some officers who work hard but are not appreciated by the authority. AIBL has not set up proper network system among branches. A remarkable portion of the total human resources is inefficient. The bank does not have any research and development division. The bank can introduce more innovative and modern customer service to better survive in the competition. They can also offer micro credit business for individual and small business. It is high time that they should move toward the online banking operation; because some banks are already introduce the online banking operation. Bank will be able to accommodate knowledgeable. Skilled, experience and hard working person by offering attractive remunerations and fringe benefits with nice working environment. By expending the financial policy with credit facility customer are very much secure in business environment. Central bank (Bangladesh bank) is always supervising the local and foreign banks in Bangladesh and sometimes it is hampering the normal operation of private bank. Through the innovation working is in continuous process, but the other rival banks are copying it within the short time. The world in advancing toward technology very fast. Though AIBL taken effort to join the stream, it is not possible to complete the mission due to the poor technological infrastructure of our country. They are carrying our aggressive campaign to attract lucrative corporate client as well as big time depositor. Local competitors can also capture a huge market share by offering similar products and services provided by the bank. Banks have their own unique strategy, which leads to their objectives. Some wishes to grow faster and achieve some long –range growth. On the other hand some banks want to lead a quite life minimizing risk and convey an image of a sound bank. AIBL is pretty new in its operation. Even though the financial analysis on the banks performance seems the banks doing very well in the banking industry of Bangladesh, and has prosperous future. AIBL has established goodwill through innovative products and services. Technological development has opened up a new dimension in the development of creative products, efficient services and customer satisfaction. The Bank must cope with this technological advancement its present status. AIBL is more capable of contributing towards economic development compared with other conventional banks by dint of commanding most of their funds. The bank sanctions investment in productive project leading to increase in production and development and also in export and import business. It may be expected that by establishing a network over the country and by increasing resources this bank will be able to play a considerable role in the portfolio of development of financing. Investment management policies and techniques used in SJIBL is comparable to international standers. The officials follow the policy very strictly. They are choosy and conservative in sanctioning loan. The aim of the internship program is to gain knowledge of practical banking and to compare this practical knowledge with theoretical knowledge. During the 12 weeks internship program, it is not possible to go to the depth or each activities of division because of time limitation. So, objectives of this internship program have not been fulfilled with complete satisfaction. However, highest effort has been given to achieve the objectives of the internship program. I think this report may show a guideline to AIBL for its future planning and its successful operation to achieve its goal in the competitive environment. Theory and Practice of Islamic Banking.